I feel like summer has come early wearing these polishes! Poolside is the perfect name for this collection. These super bright neon's are gorgeous, they have a matte/sheen finish and are extremely eye-catching! 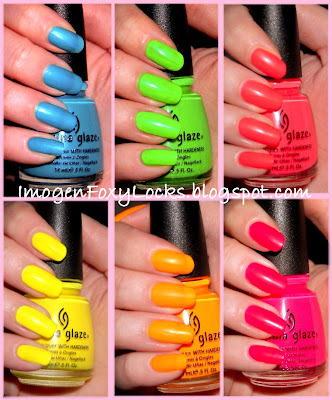 The consistency was very sheer for all these polishes, pretty much all neon's on the market are the same. I needed to apply three coats to get an even coverage. The great thing about these is they dry in record time so it's easy to build up the layers. First up is one of favorites, this is a warmer pink but still has neon tones to it. This has coral/peach undertones. I cannot wait to wear this in the summer with a tan! Another favorite of mine! Unlike the others this has a slight shimmer to it and although CG describe it as a neon blue to me this one isn't a neon. It's a lovely muted turquoise. It is extremely sheer, i would say 4 coats would give the best results. This gorgeous neon orange is well....gorgeous! It applies really smoothly, again very sheer but easy to build up. You could even wear a white base coat to really bring out the colour. This is a creamy neon with yellow undertones. If you love your hot pinks then this is for you! It's so bright and beautiful! This was the most opaque and even when applied. Very Fuschia. This was the hardest to capture on camera, in real life it is a darker neon. Most green nail polishes i have tried are sheer, i have no idea why this is but this one is no exception. I had to apply a white base coat to make it even, i really like it with the white underneath - it really brings out the colour. These polishes are so quick drying, i was very surprised, so i didn't mind building up the colour. This is so florescent, a real eye squinter! But i love it! I have never seen such a bright yellow, again it was sheer so i added a white base coat. In real life this colour looks exactly like a florescent jacket, it has some very slight green undertones (which do not show up on the photo). I am so impressed with this collection. As soon as i saw it i couldn't wait to try it, these colours are a must have for the summer! These are officially released on 1st April. omg all of those colors are beautifulllll. i want themm. I adore that hot pink color!! how crazy are these colours!? love your vids n posts! please check out my blog im soo new!! Wow, they are bright!! I've just tagged you on my blog because I bought some Models Own polish. Just saw your Krave pic - haha! They are so good! They look gorgeous! I want Towel Boy Toy & Yellow Polka Dot Bikini! I love your blog and videos! Check my new blog out I'm a beginner so it's not as good as yours!